If you are someone who is in charge of selecting and choosing headphones for hotels or motels, then you already know that there is a large number of sites and products to choose from. Cutting through the noise and products on large global sites can be challenging. The key is finding a company that is willing to work with you to help you find exactly what you need at a reasonable price. 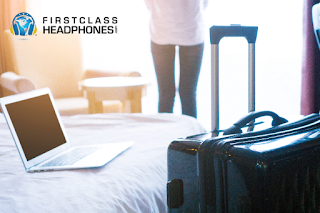 The first thing to consider when it comes to choosing headphones for hotels and motels, is that it is imperative to consider the needs of your guests when it comes to providing headphones when they have forgotten, broke, or misplaced theirs on the way to your property. One of the most important aspects of providing headphones in the hospitality industry is to consider what they will be used for and what activities the guests might participate in while staying at your motel, hotel or resort. The next thing to consider is how can you find a solution where you can easily and affordably, provide guests with a comfortable listening experience during their stay for the activities they want to do. This is where it can really pay dividends to have a number of different solutions on-hand or in-stock to ensure you are able to best meet each guests unique requirements and needs. With a significant number of online options available, we understand that you have a number of different solutions and companies to choose from, this includes hotel headphones and hotel earbuds. Stocking earbuds for hotels and headphones for motels can help to ensure that you are fully equipped to help every guest in a time of need. They will be sure to remember that you were able to provide a solution that worked for them during their trip. Leaving a lasting impression on hotel guests and visitors can lead to better reviews and increased revenue. When you create a positive and memorable experience, you are more likely to garner positive feedback from your guests. This goes a long way in building and maintaining your brand and retaining your most important customers. Although it may seem like something small on the surface, providing guests with hotel earbuds or hotel headphones in situations where theirs have been lost or broken can make a significant difference when it comes to a morning gym workout before the big meeting. This leads to an overall more comfortable and enjoyable experience. Sometimes guests just want to make sure they get their run in before they attend a big meeting or company event and if they don't have headphones it could potentially throw their morning routine into chaos. Find a number of different affordable solutions and products that will help you ensure your guests stay will be enjoyable down to the smallest details, especially when it comes to providing your guests with an enjoyable experience that they will remember for years to come. For more information please visit FirstClassHeadphones.com today! You will find a number of different options that guests will love and you will too because they are affordable and deliver high quality stereo sound. Thank you for visiting our blog. If you have any specific questions about hotel headphones, please contact our professional team who is ready to help. We are a family owned business and we are focused on bringing high quality and affordable hotel headphones that will help you provide a 5-star experience for your guests.